Depending on where you are at in the world, November 11th, 2011 could be already done and if it’s not, it must be getting close. There has been a lot of talk this year because of the whole 11-11-11 thing. Has it really made a difference to what this day is all about? Today is a day that we remember those we have lost to war. I almost didn’t write a post today even though I have written one ever since I started blogging. Before that I used to send a mass email on this day. You see my father, who is 91, fought in the Second World War. Was that the war to end all wars? If it was, it didn’t. My father flew a Spitfire. I am proud of that as much because of what he was fighting for as because I cannot imagine doing what he did. I don’t really know what he did, he never spoke about it. Why would he? I thankfully have never lived what he and so many others lived and still live today in wars that are going on throughout our world. I am far too naive in how I look at the world. I expect everyone to see things like I do. If we look around at all that is going on how could we think that more fighting, more killing, and more war could be the answer? Everywhere in the social media channels today we are seeing poppies in profile photos, reading stories of war veterans, sharing of children’s takes on all of this and I want to say it is enough, but I will challenge you on if it is and ask that we all continue to talk and share about the possibility of peace and by doing that, just maybe, we will find our way to a true peace one day. I want to think that maybe if we all would do that, then things would change. I have to hold on to that maybe, for in that maybe there is hope. And hope is why my father flew a Spitfire so many years ago and it is why we wear poppies today and why we must continue to remember. Sunday was a beautiful morning and I headed downtown. First stop was going to be to see Ground Zero and second stop: Occupy Wall Street. No need to mention the appropriateness of the two side by side. That is the whole point of where the occupation is. 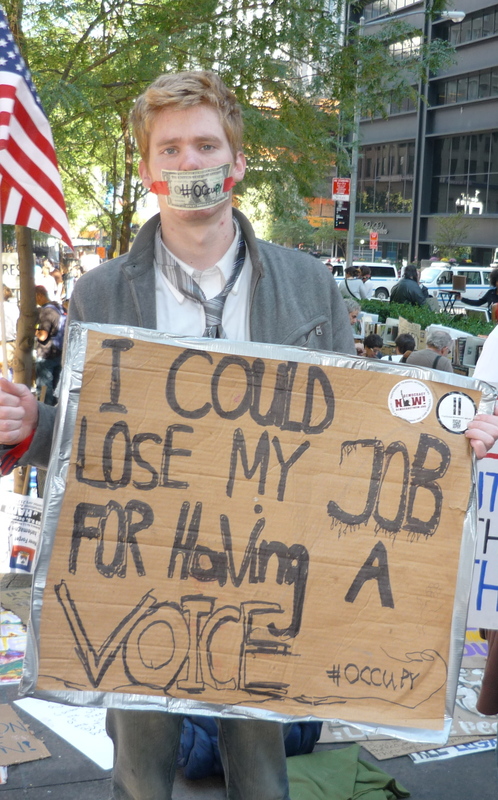 I never got to see Ground Zero, I didn’t have photo ID with me, but I did get to see Occupy Wall Street, actually I got to smell it as well. 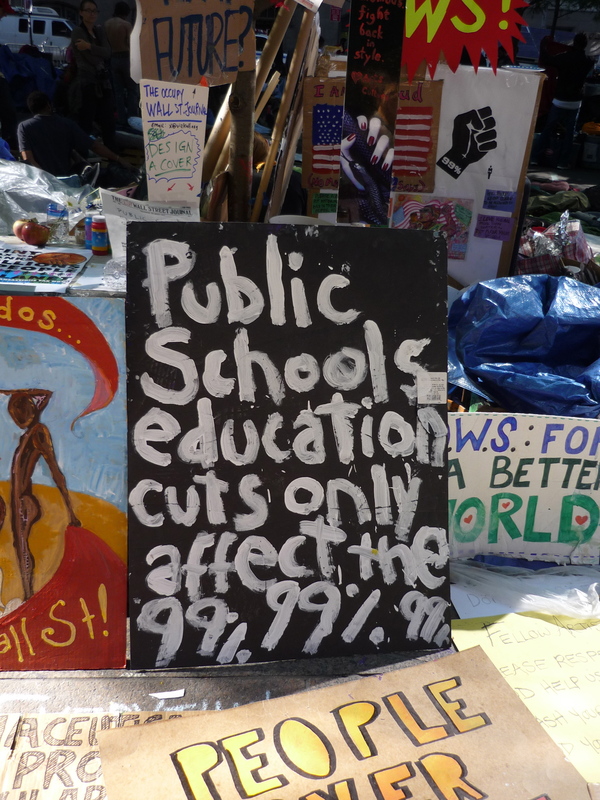 There in Zuccotti Park in Lower Manhattan were I don’t know how many people sitting, talking, making posters, eating, doing what you do when you live in a park protesting against the divide between the have’s and the have not’s. I am not going to explain the movement, you can Google Occupy Wall Street and you will have more links than you will be able to read or watch. 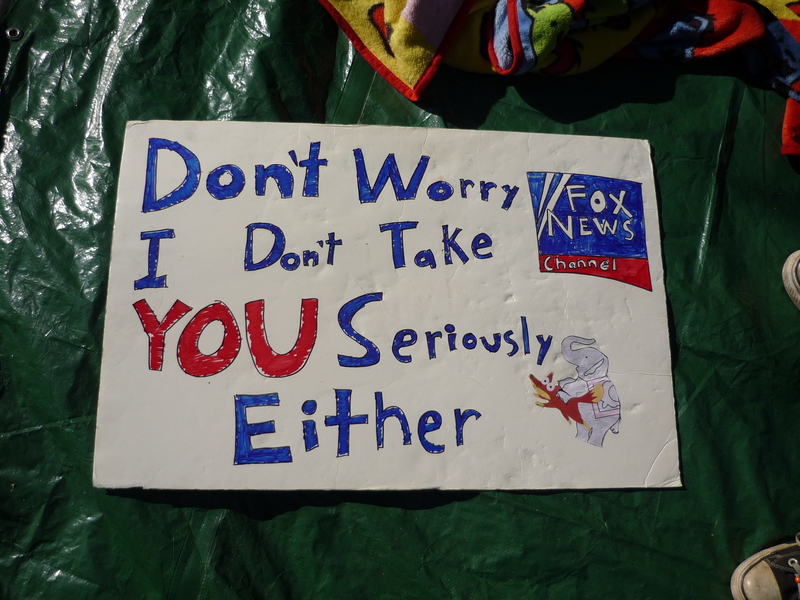 This is just about what I saw on Sunday when I sat down with a few of the protesters to do my best to understand this. Hey, my name is Simon, I am from Montreal and I have a blog called The Social Effect which is all about the idea that each one of us can make change in our world if we want to….and I guess this what you are doing here. Mind if I ask you a few questions about what this is all about and why you are here? I usually added in, I am an old guy from…. as to most of these kids, I am sure that is what I was. And that is part of what this is all about. But I am getting ahead of myself. 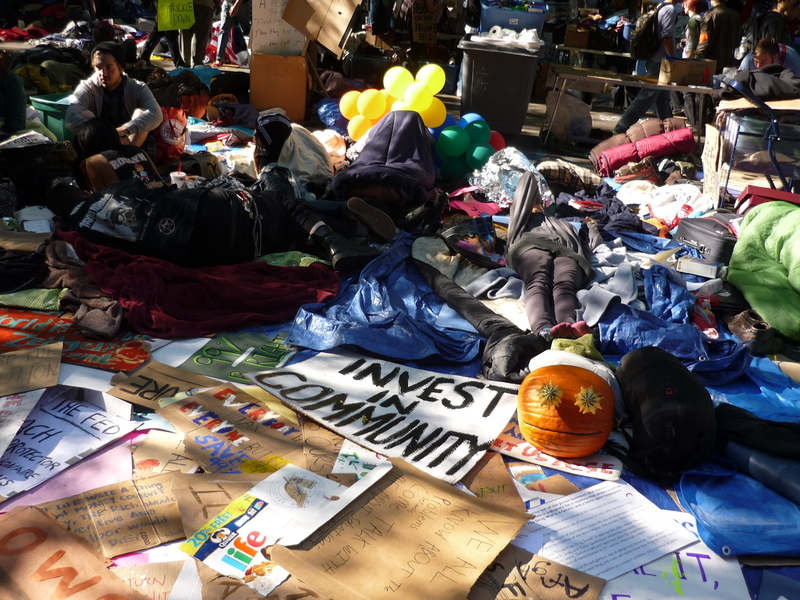 Each person I spoke to talked to me about the obvious reason that all the protesters were there, the financial chaos that they see affecting the world and the need for regulation to stop this. But there is more to it than that. Much more. This is a movement for occupation, an opportunity to rebuild and to fight against the enemy. Who is the enemy? Those trying to oppress. We are fighting for a better world, for the essence of what it is to be human, to reconstruct. I asked her if she was afraid of anything. Fear is optional. This is an opportunity. She was a little intense for me and I did feel like she was trying to indoctrinate me and perhaps herself in everything she was saying, but in any grass roots campaign must there not be the zealots who believe, who fire up the others, who keep the message clear and protected? That was Trista. I made my way along and sat down next with Brendan, who is 20 years old and he had been there for five days, he studies history in Connecticut. Money is buying the politicians. There is no true voice because they have been bought and paid for and the one with the biggest purse behind them always wins. He spoke to me about poverty and about not wanting to live in a country that based itself on money alone. He was heading back home that day. Next I sat down with Collette, who is 37 and from the Lower East Side. She was surrounded by a group who seemed not too impressed with me, but once we started to talk they opened up. Collette was quick to point out that she has a job and lived near there but believed in the cause. She hadn’t slept there every night but she was there as much as she could be when she wasn’t working. For her this wasn’t about the 99% versus the 1% this was how the two could unite. She had seen a big change since Giuliani had been in power. We don’t talk to each other anymore. The dividing line between rich and poor is so great that we don’t care anymore about just being people. I stop now when I see garbage on the street and pick it up. I talk to people. This really is about feeling part of something, about not being alone. I got that. I started to feel like I was getting more and more of what this is all about. Next I sat down with David, 23 years old and from California and had spent one night there. He hadn’t known anything about this but his Mom had told him about it and he and his friends were doing a tour of the country and thought it would be cool to check it out. They all had matching red, white and blue velour track suits on and I wasn’t sure if their hair was real or they were wearing afro wigs from the 70’s. There is no unified message here. We need higher taxes for the rich and more regulation on the financial side. He didn’t know quite what to say after that. I wasn’t sure if he really knew why he was there or it seemed like something to be able to say he had done on his trip. Then I saw a group all wearing blue t-shirts that had “Blue Crew” written across them. I sat down with Sean, 20 years old who was studying sociology from Cincinnati. Sean talked to me about job loss and foreclosures, about the poverty in Appalachia. Whoever has the money wins. We need to touch hearts, to make change. This is about greed. But no one is really able to articulate the movement. I would never be like ‘them’. I would be different. The world was wrong. It wasn’t fair. It shouldn’t be like that. It doesn’t have to be like that. I would make it different. But I didn’t. I finished college and got a job and bought in to everything I said I wouldn’t. I gave up. I forgot what I believed in. That’s what these protesters are doing, fighting for what they believe in. It is certainly a voice that is getting stronger and stronger and spreading as I write this. This is an opportunity for all of us to make change. What if we didn’t make fear an option and chose change instead? It is your choice, and in many ways I think that is what this movement wants to give us, a choice. Every morning I get on my iPad and I read the newspapers, go through Twitter and then check Facebook – first my personal page and then the other pages that I am administrator for, one of which is The Social Effect. About a week ago, as I was scrolling through the Newsfeed for The Social Effect I came across a post about a Flash Mob Meditation in London. I happen to be a fan of Flash Mobs. I have wanted to take part in one or stage one for years. I can’t tell you how many times I have watched the Oprah Flash Mob in Chicago or the Sound of Music Flash Mob in the train station in Belgium. I am not sure exactly what it is about them, the reference to old style musicals when everyone would break into dance, the simple joy of the onlookers, or is it just that they are a lot of fun! When I saw this idea of meditation and a flash mob THAT caught my intention. Yes, meditation is part of my life. When I am consistent it is morning and night, and when I am not, it is when it is. That simple. To put the two together seemed genius to me. I checked out the site for Med Mob Inquire Within that was the parent organization to see if there was a Meditation Flash Mob in Montreal and found there was only one in Ottawa. It was almost before I knew it that I had typed and posted an inquiry on the MedMob page to ask how I could go about setting this up in Montreal. By noon that day I had spoken to Patrick in Austin Texas and heard his story about how the first Mediation Flash Mob had started, and by noon the next day, with Patrick’s help, I had a Facebook page and a Facebook event set up. If that does not show you the power of the Internet when we are willing to take action, I don’t know what does! Is this not the time to create the world we choose to live in? On July 28th, over 94 cities around the world will meditate in highly visible public spaces. The intention is to expose the world to meditation and expand positivity to every walk of life. It is an event that is open to everyone, from every path, experienced or not. This is a movement that is happening throughout the entire world so we come together as one unified force to set the momentum for the future of our planet. The future of our planet? And we sat in meditation. Or as quietly as we could. We will never know until we do it will we? That is what I thought. But that is why they call it the practice of meditation. It is not something we perfect; it is something that we do. And when I do it, I am surprised at what I hear or learn about myself. Not always what I want to hear, and often I don’t learn anything. I always do come away a little quieter, with a little more space and patience and a lot more love for whom and what is around me. I started meditation as I went down a Buddhist path a few years ago, but mediation is part of all religions, some of our western religions just hide it better than others. Now it is part of my life and has no religious implications for me. It doesn’t need to for you either. 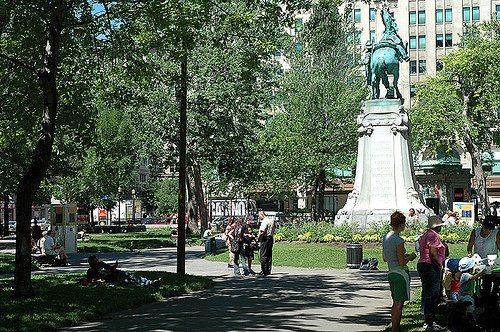 So why don’t you join us as we mediate on Thursday, July 28thfrom 12 to 1 in Dorchester Square in Montreal? Then see if your city is having a Med Mob and mediate there. You are working and can’t make it? Sit in silence wherever you are. That works too. Or do what I did: START ONE. Contact Patrick at inquire@medmob.org. Now, I have a favour to ask. I would like to get more people out to our first mediation next week. I have shared the event with all of my friends and many of those attending have done the same. If you are on Facebook, would you share it with your friends? Even if they are not in Montreal. Maybe they have a friend that is, or it will pique their interest and they will find the MedMob going on in their city. On the left under the photo you will see a box that says +Select Guests to Invite – click on it. A box will pop up with all of your friends. Click on their photos, add a personal message at the bottom if you like and then click submit. It’s that simple. Right now we are at 40 Attending, 48 Maybe and 466 Awaiting Reply. It would be amazing to see 100 attending and 1000+ Awaiting Reply! You can bring your kids or you can bring your parents, or: BRING EVERYONE! This is going to be a beautiful event that we will all remember. You are welcome to come to the entire event or for part of it. You can meditate the entire time, or you can sit and bask in the peace. Come experience the power of collectively exuding peace and feel the impact we are having by sitting together, silently radiating happiness and grace in all directions. Simple acts can stimulate major paradigm shifts in thinking and with all we have going on in our world, I am not sure that would be a bad thing. 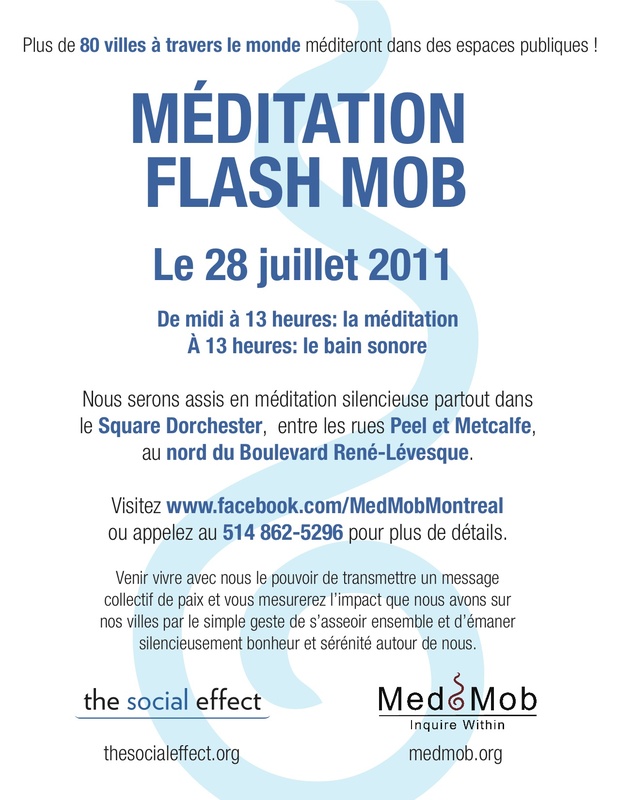 If you would like to join the Mediation Flash Mob Event on July 28th, click here. If you would like to join the Montreal MedMob Facebook page, click here. If you would like to learn more about MedMob Inquire Within, click here.